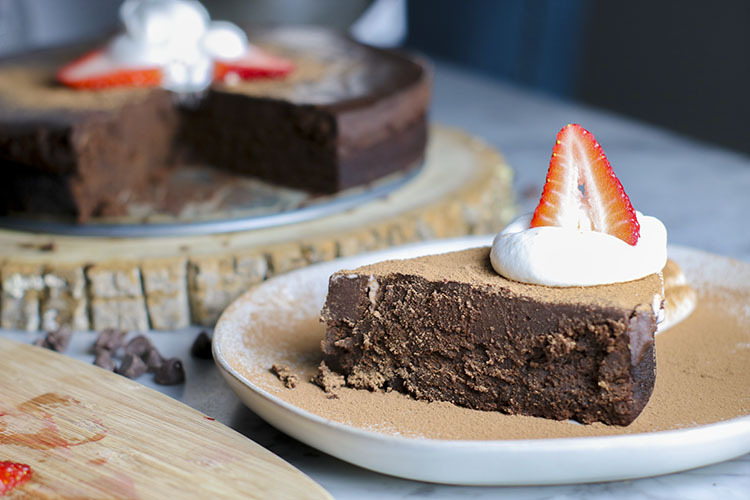 This Flourless Chocolate Cake is the definition of decadence. 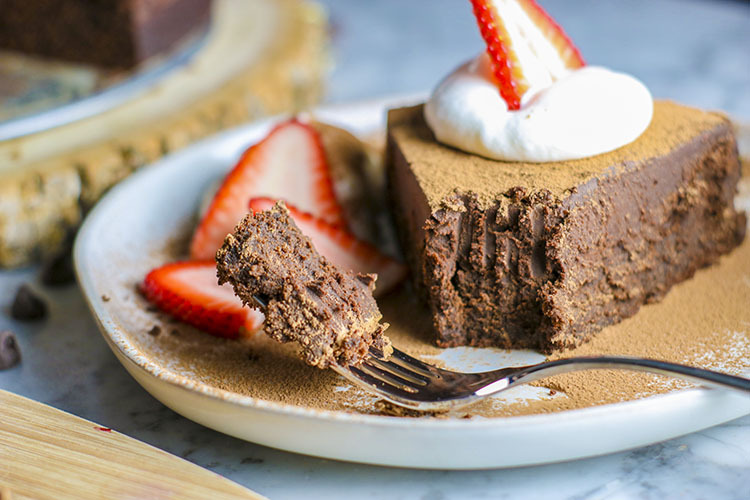 I know I say that a lot of desserts are “rich” – but like really, this cake is RICHHHH! 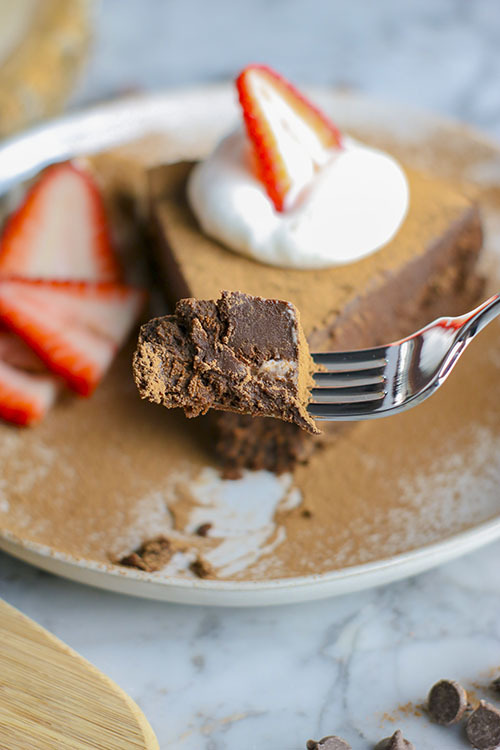 Dense flourless chocolate cake, drenched in sweet chocolate ganache. It tastes as rich as fudge – but better, because its cake. This cake will look and taste impressive but is honestly SO easy to make. 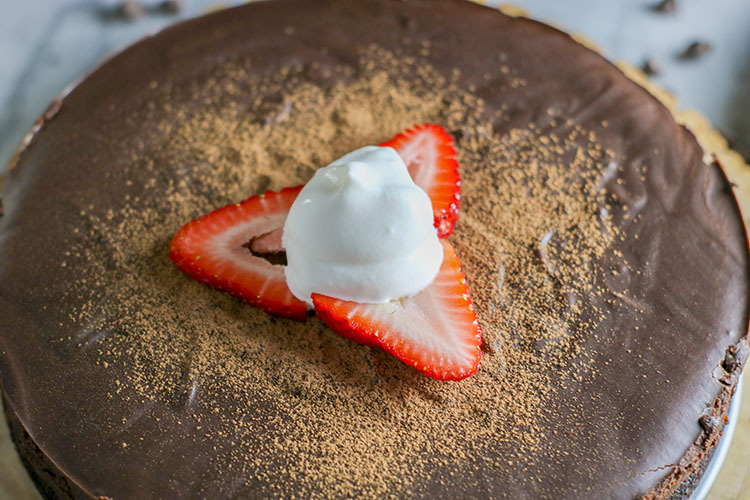 6 simple ingredients for the cake, 2 for the ganache – 7 ingredients in total (because there is chocolate in both – duh!). 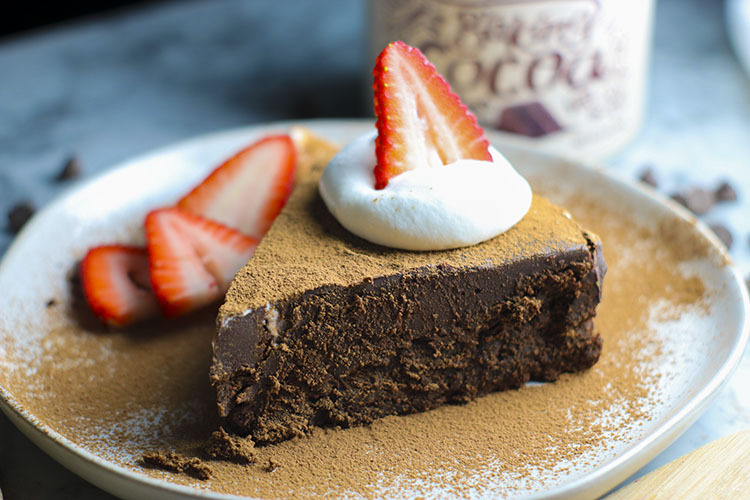 Amazing with milk, ice cream, strawberries, and/or whipped cream… NOM NOM NOM! 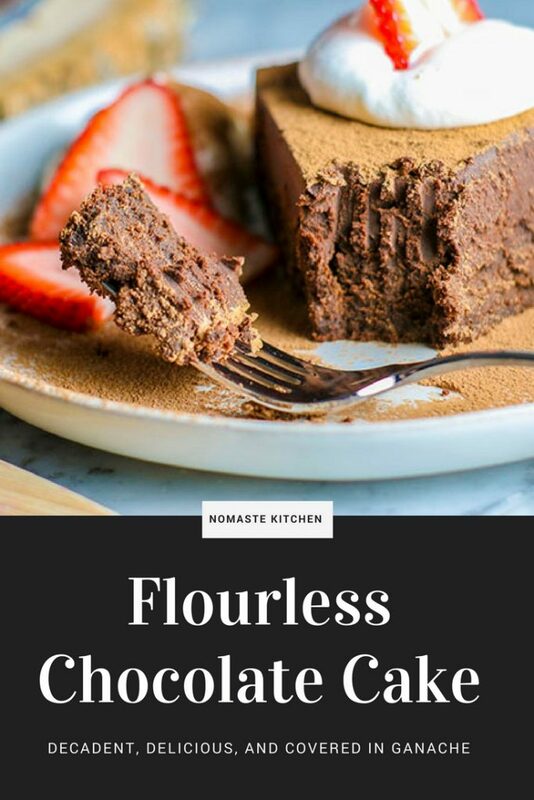 If I had to choose between normal chocolate cake, and this flourless chocolate cake – I think I might choose this flourless! Seriously, it is THAT good! What’s the best part? This cake is Passover-friendly. 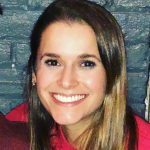 PASSOVER OH PASSOVER – as I have mentioned before, Passover is my LEAST favorite holiday. I mean come on – no bread? That basically means no baking!! And I loveeee baking! Don’t get me wrong, I love me some Matzo. Especially in the form of Matzo Brei – so good! Matzo ball soup, potato kugel, brisket, gefilte fish (I am probably the only person in the world who actually truly enjoys gefilte fish), tzimmes, etc. It is all delicious! But, why can’t I eat my matzo with a side of toast? Just kidding – but seriously… Pfff fine – okay okay. I get it. I am not supposed to eat bread. But I STILL need dessert. 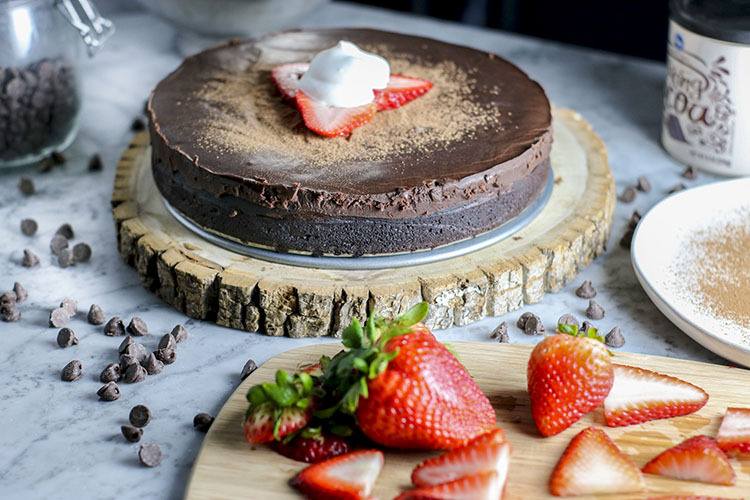 When it comes to Passover-friendly baking, THIS Flourless Chocolate Cake absolutely reigns king… I promise that you will (at least temporarily) forget how sad you are that you cannot eat bread. 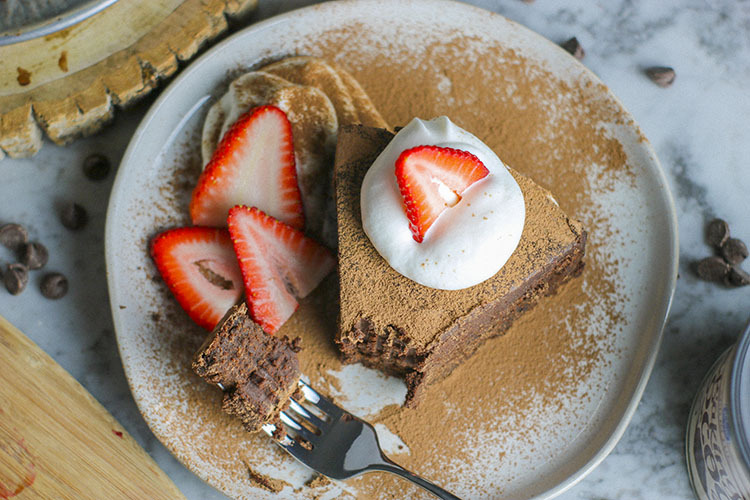 This flourless chocolate cake is the definition of decadence. 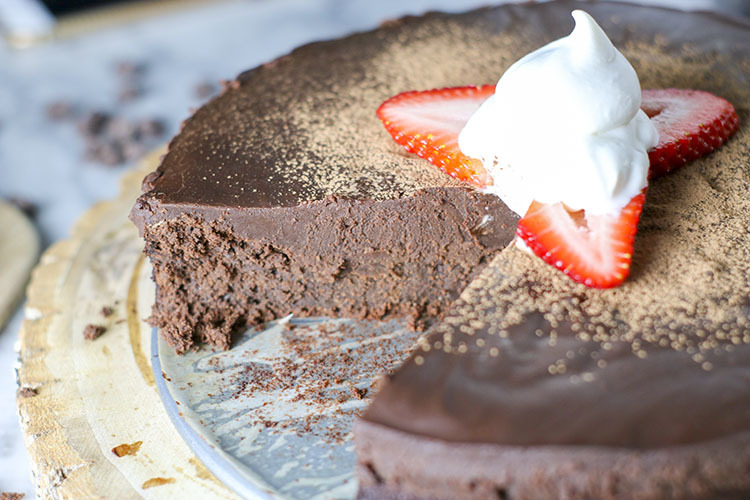 Dense chocolate cake, drenched in sweet chocolate ganache. Like fudge - but better, because its cake. Amazing with milk, ice cream, strawberries, and/or whipped cream... you cannot go wrong with this incredible dessert. Preheat oven to 375F. Line a 9 or 10-inch spring-form pan with parchment paper. Butter the paper and sides of pan, then set aside. In a double-boiler (you can use a normal pot, but be careful not to burn the chocolate), melt butter and chocolate together over low-medium heat - stirring often. Once chocolate has completely melted and fully combined with butter, remove from heat. Whisk sugar into chocolatey-butter. Allow to cool slightly. One at a time, whisk in eggs then vanilla. Sift in unsweetened cocoa powder, and whisk until fully combined. Pour batter into spring-form pan, allowing it to spread evenly to all sides. Bake at 375F for 25-30 minutes, or until an inserted wooden toothpick comes out clean (from center of cake). Top of cake may begin to crack while baking, this is okay! Remove from oven and allow to cool completely on a wire rack (do not open spring-form pan!). While cake is baking or cooling, it is time to use your double-boiler again! Heat cream in double-boiler over low-medium heat for a few minutes - we do not want the cream to boil! Add chocolate to cream and continue stirring, or whisking, until all chocolate has melted and the mixture has become a thick chocolate sauce. If the sauce does not appear thick enough - add more chocolate! When lifting the spoon/spatula/whisk, sauce should slowly fall - not quickly drip - from utensil. Think thick hot fudge sauce! Remove ganache from heat - allowing to cool slightly. 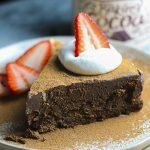 Spoon chocolate ganache over cake, spreading evenly with back of spoon or spatula - use just a little bit of ganache for a thin layer, or all of it for a thick-more decadent dessert. 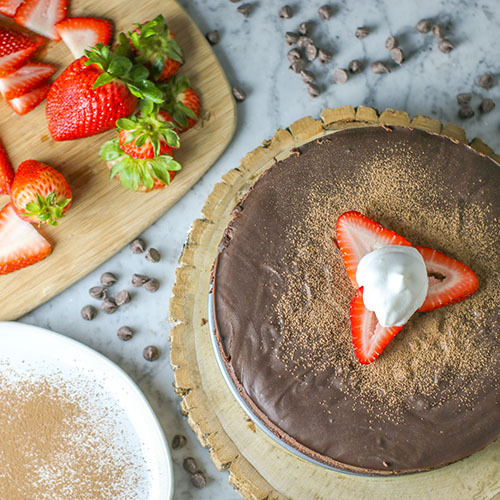 Allow ganache to fully cool on cake before refrigerating. Allow cake to refrigerate for at least 30 minutes so ganache and cake can become friends - the longer these two parties can mingle, the better! Run a knife under warm/hot water, then run knife around edge of cake to separate from side of pan. Remove spring-form. 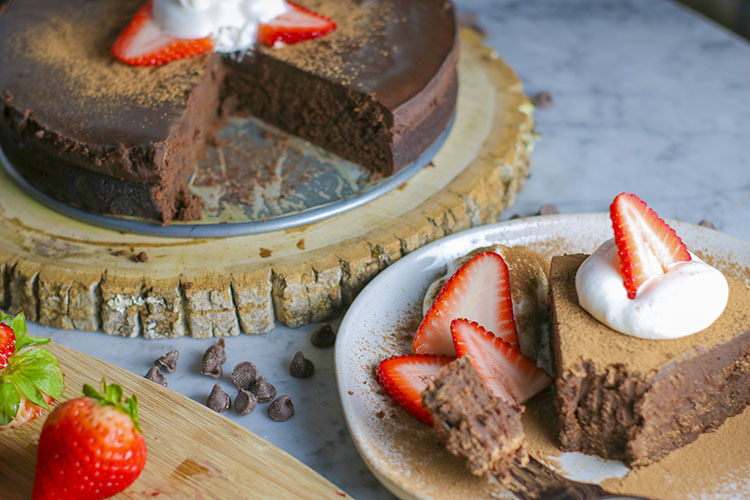 Slice and serve with milk, ice cream, strawberries, or whipped cream! YUM! Storage: Cover with plastic wrap and refrigerate for up to 1 week or freeze for 3-4 weeks.